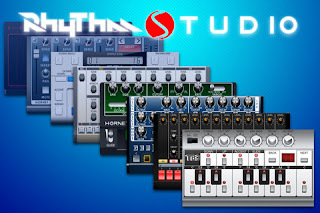 Orange County, California - Pulse Code today is pleased to introduce the third major update to its premier universal electronic music making app, Rhythm Studio. The third major update has many features requested by users. These features include WIST sync which enables you to sync the start and stop of two iOS devices playing Rhythm Studio or other WIST supported apps. Bluetooth file sharing allows you to wirelessly transfer songs to a friend without going through the hassle of connecting a computer or using email. The Phoenix Super Saw synth is included which has 7 detuned oscillators that allow you to create huge synth string sounds to heavy bass sounds. Rhythm Studio 1.06 is on sale for one week at only $0.99 USD (or equivalent amount in other currencies) and available worldwide exclusively through the App Store in the Music category. With headquarters in Trabuco Canyon, California, Pulse Code creates inventive musical applications for the iOS platform. The people at Pulse Code have a love for electronic music and the instruments that create it. Our goal is to spread this appreciation to new and inspired minds. Pulse Code has its roots in homebrew audio development since 2005. In 2008, Pulse Code officially became an iOS developer. All Material and Software (C) 2005-2012 Pulse Code Inc. / All Rights Reserved. Apple, the Apple logo, iPhone, iPod and iPad are registered trademarks of Apple Inc. in the U.S. and/or other countries.